Refractories are an essential component in the manufacture of many products. From the blast furnaces that house molten steel to the brick in your home fireplace, refractories are specified because they can take the heat. They come in all shapes and sizes, for a variety of applications, with the commonality of being able to withstand temperatures in excess of 1,000°F. They have held and will continue to hold an important place in American manufacturing and construction. What factors will contribute to – or detract from – refractory sales? Will the importance of advanced ceramic refractories offer a competitive advantage? What problems lie ahead, and how will the refractories industry respond to them? 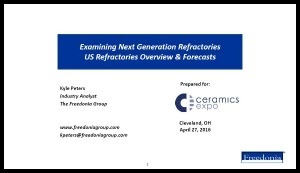 Fill out the form to gain valuable information on the US market for refractory materials.